The fight with the Minotaur was a little scary. I wanted both parties to have at least one good attacker, so I put my Chemist and Beastmaster on the right tower. 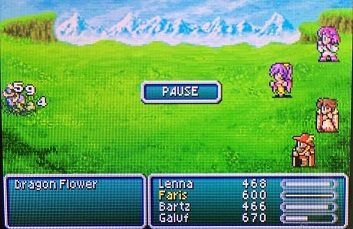 Butz drank a few potions to boost his stats and he mostly focused on attacking while Faris healed with items, sneaking an attack in herself once in a while. I finally have Flare and Holy! Up until now my Spellblade has been very useful, but only in limited situations (mainly targeting certain elemental or status weaknesses). With Flare, I finally have a great all-purpose Spellblade: enchanting my weapons with Flare gives them a ridiculous attack power boost and causes them to ignore defenses. I'm going to be using this one a lot. And with Holy, my White Magic-using party members now have access to a powerful offensive ability. With that I have everything I need to finish the game. To the Rift! Kat - 1. Blue Mage 2. Berzerker 3. Beastmaster 4. ??? Scotty - 1. Monk 2. ??? 3. ??? 4. ??? Can you have multiple bard songs active at once? Yes. And note that some Songs (Requiem, Alluring Air, Mighty March, Romeo's Ballad) don't lock you into singing. And the ones that do keep you locked until the singer's hit with a physical attack. The final dungeon awaits! Hopefully I'm not too underleveled/undersupplied. Calofisteri, as it turns out, is vulnerable to Mute. She was no trouble at all. I attempted Omega for **** and giggles. 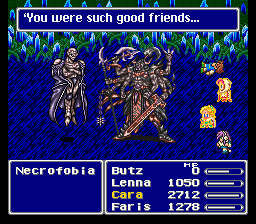 The first time he wiped out my party before I could get a single hit in. A couple of attempts later I was able to do a little damage before he annihilated me, but I decided to give up and move on. 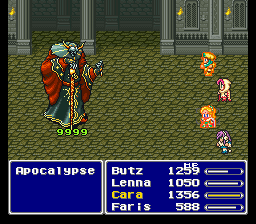 Man, a lot of bosses in this game can be silenced. 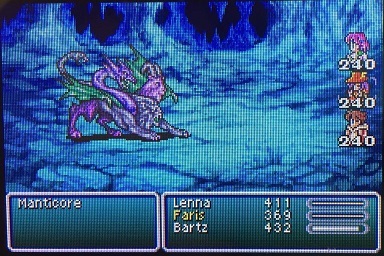 I had Butz using the Mute spellblade and Krile using the Firaga spellblade, while Faris attacked normally and Lenna healed. It was an easy fight. 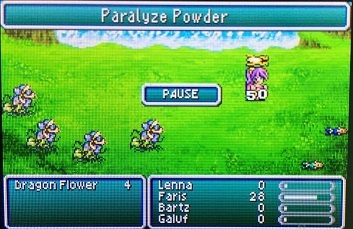 This battle is very easy if you're able to cast Float on your party members. I was not*. 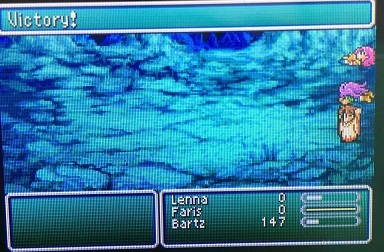 So the fight consisted of Butz and Cara attacking relentlessly while Lenna and Faris tried to keep everyone alive. * Well, there's actually an item you can use through the Mix command, but I forgot to assign that command to one of my party members before the battle. Azulmagia was a pain. Lv. 2 Old crippled my party, and his repeated casting of White Wind undid most of the damage I was doing to him. It was a long, annoying fight. Halicarnassus on the other hand wasn't so bad. 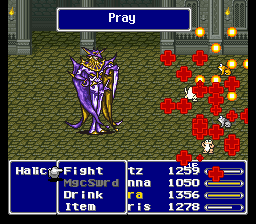 Lenna was able to counteract his frogging of the party, and the only dangerous attack he had was Holy. I hit him with Holy spellblade and he died immediately. Here we are! Final stretch! All right y'all, playing a little catch-up now. The move has been settling down, and I have a week or so of free time before my internship starts. Hoping to bust this out in that span. Purobolos were simply not fun. 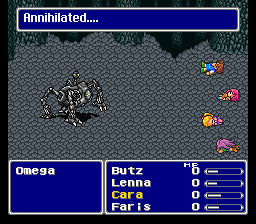 Basically, one Self-Destruct was equal to one of my party members down, and I couldn't damage them fast enough to try to shut that down. Basically my only method of winning was to hope that one or two did Self-Destruct, but not the other ones, so that I could heal up before they went ham. It took...4 or 5 tries, probably, before I got the right luck. Titan was rough. 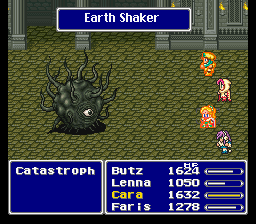 Earth Shaker would one-shot my party on most damage rolls. 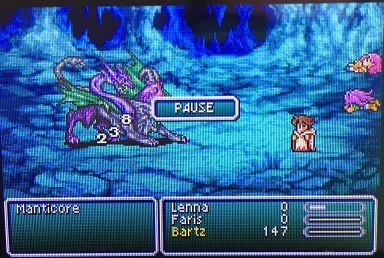 I had Faris hiding for the final Earth Shaker at the end, and of course that was the one time that the damage roll was low enough for Lenna and Butz to survive as well. Go figure. Oh well, more EXP. Hail Mary Fira. 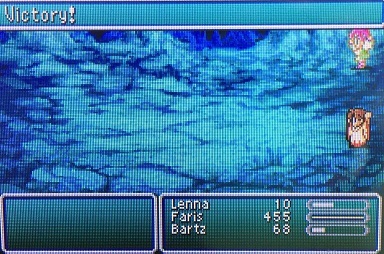 Butz would not have been able to resurrect any party members while still surviving, and he was low on MP (a constant problem for me). I figured, what the hell. Let's see what happens. He's got one more offensive spell in him. This may be Moment Of The Run so far. 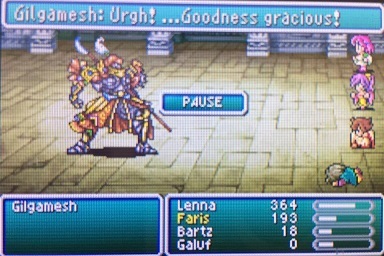 The second phase of Gilgamesh 2 was harrowing, but I made it through. 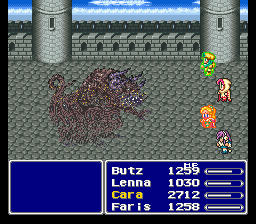 Boss battles in general are always going to be scary in this run. The final gauntlet in the Void will be something else, man. Before I moved on from Regole, I stuck in the forest nearby and grinded on these suckers for 2 levels. They were very susceptible to Confusion, so I would do an Alluring Air and then cast Fira, meanwhile watching them commit suicide with Transfusion and heal my party in the meantime. Painless grinding for the most part. I made it to Castle Surgate. I'm learning that Dancer isn't quite as useless as I had initially thought. I'm gambling by having Faris in the front row, as you may have noticed. The 1/4 chance of Swords Dance dealing 1300+ damage is just too good to pass up--nothing in my arsenal can do even close to that amount of damage. 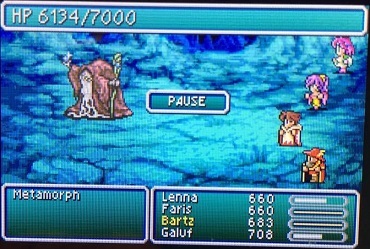 Jobs are going to rotate soon, now that Bartz is close to mastering White and Galuf finally got Red Level 3. I also attempted Shinryu for **** and giggles. I lasted about ten seconds. Gonna pass. Necrophobe was very difficult, and gave me my first party wipe since Manticore (not including the bonus boss attempts). It was hard healing the damage dealt by the Barriers, but I had a chance to catch my breath after three of them went down. After that I didn't have too much trouble holding off until Gilg came to save the day. Good luck on the final encounter, Val. Thanks mate. I might grind up for it a little, since my party's only in the mid-30s levelwise. I'm really happy I rolled Mystic Knight for offense and White Mage for support. Beastmaster and Chemist have been less useful, but they've helped a bit in their own ways. I rushed yesterday to catch up. My water job roll is Mystic Knight. Playing as Monk has been super easy. Nothing really amazing or interesting to report. Having only monks is pretty economical since I didn't bother to buy anything except items, so I have lots of gil. I haven't really used Mystic Knight before so this will be interesting. I also just realized something plot-ish related. Funny how you catch things the second time around. 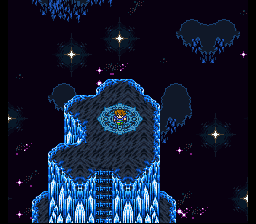 In the Walse Tower, the crystal cracks and there's one shard that falls on a ledge that you can't get and it bothered me last time. I tried to see if I could get it this time but then it hit me right away. That's the Mime job! The tower falls into the sea and then after the worlds are combined, you can dive there with the airship/sub and get it. I totally didn't connect the two during my last playthrough. ^That shard behind the wall bugged me so much on my first playthrough. I must have spent 5 minutes trying to get to it. "But what if I don't have all the joooobs??" [QUOTE="Marilink, post: 1640178, member: 23215"]Before I moved on from Regole, I stuck in the forest nearby and grinded on these suckers for 2 levels. They were very susceptible to Confusion, so I would do an Alluring Air and then cast Fira, meanwhile watching them commit suicide with Transfusion and heal my party in the meantime. Painless grinding for the most part. 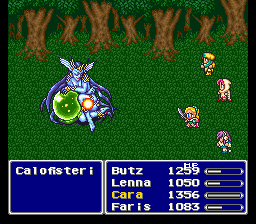 And yeah, the Dancer is your best source of Damage/DPS your party has at this point... whenever Sword Dance hits. [QUOTE="ScottyMcGee, post: 1640226, member: 31048"]I rushed yesterday to catch up. My water job roll is Mystic Knight. Yeah, Monks are strong like that early on, and barehanded is one of two weapon types that can innately Crit. 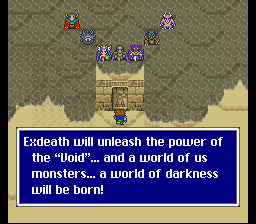 Also, prepare to spend some of that Gil, and not just on Weapons and Armor. 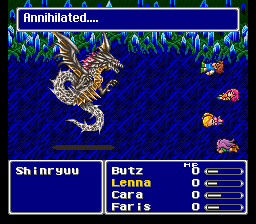 So, uh, this fight didn't go particularly well the first time. I got really caught off-guard by all the status effects. 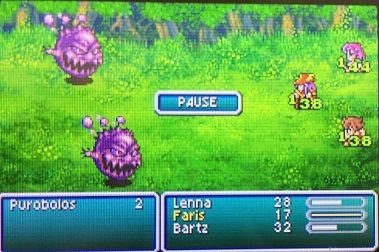 The first time through this battle, I had to sit and watch as my party members slowly killed themselves with confusion and poison. Much better. The little flowers were all vulnerable to Confusion, so Alluring Air provided great crowd control and they stayed off my back. I got super unlucky with Dance rolls in this game, getting Mystery Waltz at least 8 times, but I was able to keep everything under control even with bad damage output. 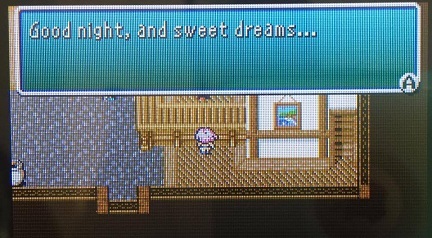 I was pretty scared of Atomos when I got there, but then I remembered Val mentioning that he was vulnerable to sleep. So basically I just put him to sleep and Fira'd him to death. Made it through the battle with very little issue. It was such a grind getting through here, and these guys don't even yield that much XP or anything. I have no way of dealing 7,000 damage quickly, and even less so if I get unlucky with Swords Dance rolls. blegh. This took forever. And I almost wiped on a Zombie Dragon transformation, which would have been just about the worst thing ever, because I would have had to do the whole thing over again. Either way, I made it. 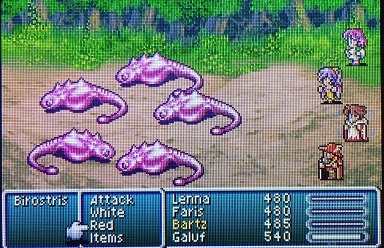 I have Curaga and I'm heading through Moore forest. I'm nervous for the Crystals battle, but we'll see what happens. 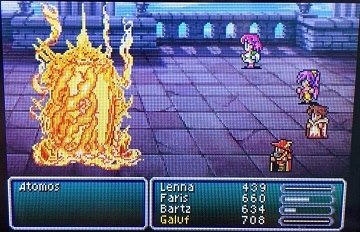 I'm debating on my secondary ability for Lenna, who will be my White Mage. 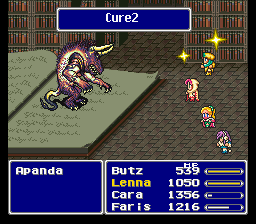 I can't decide if I want her to Equip Ribbons, or Dualcast. Equip Ribbons gives me a healer who can't be status'd, which is very useful. However I'm not sure how useful this would actually be in the late-game, because I don't know the bosses as well as y'all. Dualcast would give me a very powerful Mage who could heal and damage in the same turn, or do double Holy for massive effect. However, the major downside here is that I'd be spending a lot of time in the Bal Castle Basement doing a bunch of ABP grinding. Is the grind worth it for a dualcasting White Mage? Or are Ribbons a nice, useful, easy alternative? The ribbons weren't that necessary in the end for me. I used Dual Cast like there was no tomorrow. I'm leaning more towards Dualcast. It'll be really handy being able to heal twice in one turn, and it'll free up the accessory slot for a Gold Hairpin or something else like that. Dualcast. Also add on to that double-casting Shell. That might come in handy against ailments too. Edit: at least, Magic that causes ailments.